A shadow Wales team laboured to an unconvincing, uninspiring 17-7 victory at the Millennium Stadium that had little relevance ahead of next weekend's showdown against Australia. First-half tries by centres Owen Williams and Ashley Beck put Wales in control, but an anticipated runaway win did not materialise due to a combination of numerous errors and resilient Tongan defence. Full-back Leigh Halfpenny kicked two conversions and a penalty - he has scored 42 points during Wales' autumn campaign - while Wasps wing Will Helu touched down for Tonga, with fly-half Latiume Fosita converting. Wales boss Warren Gatland made 11 changes from the team that claimed a record 40-6 victory over Argentina last Saturday, with only Halfpenny, wing George North, prop Rhodri Jones and flanker Justin Tipuric retained. Gatland undoubtedly had one eye on next week's clash against Australia, but while there were still opportunities for players to press claims - especially as Wales had already lost six personnel through injury from an original 35-man autumn squad - few stepped up the mark. Wales did not muster a point after the 25th minute, and the second-half finished scoreless, which meant there was little to enthuse a 45,000-strong crowd. Wales' performance was as drab as their all-grey change kit, but Gatland knows the real business is reserved for eight days' time when a much-changed team will target a first win against Australia since 2008. 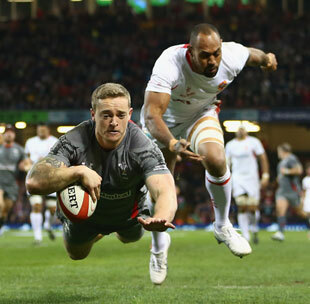 Wales made a hesitant start in terms of keeping possession, but they almost went ahead after five minutes when skipper Ryan Jones charged down Tonga scrum-half Taniela Moa's clearance and Lloyd Williams crashed over the line, but he was unable to ground the ball. Wales, conquerors of Tonga on each of the countries' previous six meetings, had to be patient before stinging their opponents by scoring 10 points in two minutes. Halfpenny kicked an angled penalty to open Wales' account before they claimed a sparkling try after attacking from deep inside their own half before the move ended with Williams smashing through three challenges during a 40-metre charge for his first Test touchdown. Halfpenny added the conversion and Wales were off and running, illustrating firm attacking intent before they struck again nine minutes later. This time it was North who made it possible, powering deep into Tonga territory before quickly recycled possession saw Beck cross wide out after he collected fly-half James Hook's floated pass. Referee Mike Fraser required confirmation from the television match official, as he had done for Williams' score, before awarding the try, and Halfpenny's conversion made it 17-0. Tonga were their own worst enemies at times, spilling possession at regular intervals, but they finally breached Wales' defence six minutes before the break. Gloucester flanker Sione Kalamafoni carried the ball strongly to just outside Wales' 22, and Helu's superb attacking angle allowed him a clear run to the line, with Fosita converting. It was a solid riposte by the visitors, but Wales still trooped off at the break holding a 10-point advantage. Wales almost extended their lead within seven minutes of the restart, but 19-year-old debutant wing Hallam Amos was narrowly denied a try by his right foot being in touch after he collected Halfpenny's pass. Kalamafoni, though, had been hurt on the other side of the pitch, and while play went on he was put into a recovery position by Wales players Tipuric and Ian Evans before medics could treat him and then help him off. The second period was a dire affair, with both sides lacking a creative spark, although Wales should have scored 10 minutes from time when North touched down only to see the try disallowed because lock Luke Charteris illegally blocked an opponent. That episode just about summed up Wales' second-half showing, but having lost to Samoa in last year's Friday night autumn fixture and only drawn with Fiji two years earlier, they were happy to take the win.